Making this one up as I go! 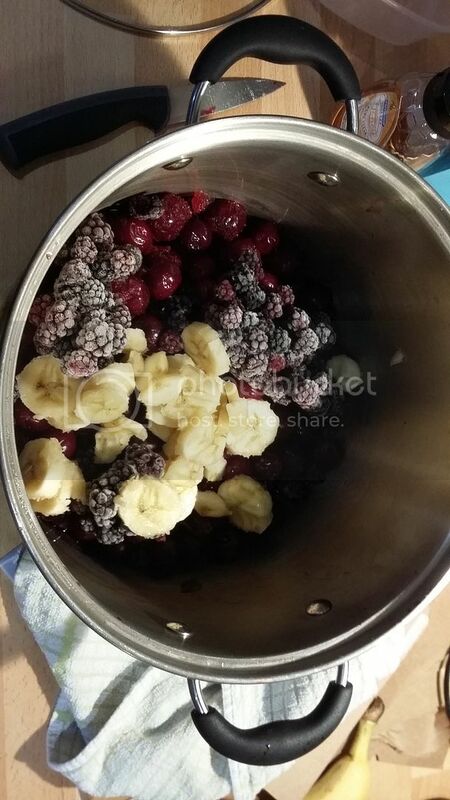 I have some cherries(1.5kg including stones) blackberrys (260g) banana pectolase and yeast nutrent and 2 liters of red grape juice in so far. I'm just defrosting the berries now! I will add yeast when it's warmed up. So I rehydrated my (slightly out of date) wine yeast.... and nothing happened. Flatter than a mill pond. So I panicked as I had just strained the whole mixture through a seive, pressed the fruit through the seive to remove the seeds and put the seeds and skins in a mesh bag and added that back to the fv. Too much work to abandon to wild yeast! Then I remembered the champagne yeast I had in the bottom of a recently bottled cider, so I gave that a good shake and added that, along with the rehydrated wine yeast. It's going to be a winner! Cider yeast is champagne yeast right? Here is a picture of the fruit before the juice went in and the mushing started. So I moved this into a DJ last night. I couldn't get a photo of it due to her proximity! I have since split it between the DJ and a couple of bottles. So I've just racked this into a clean dj and had a wee taste in the process. It's the nicest wine I have made to date! It might actually get drank! I think I'm going to go and pick so more cherries off the tree on the garden with a mind to remake this! 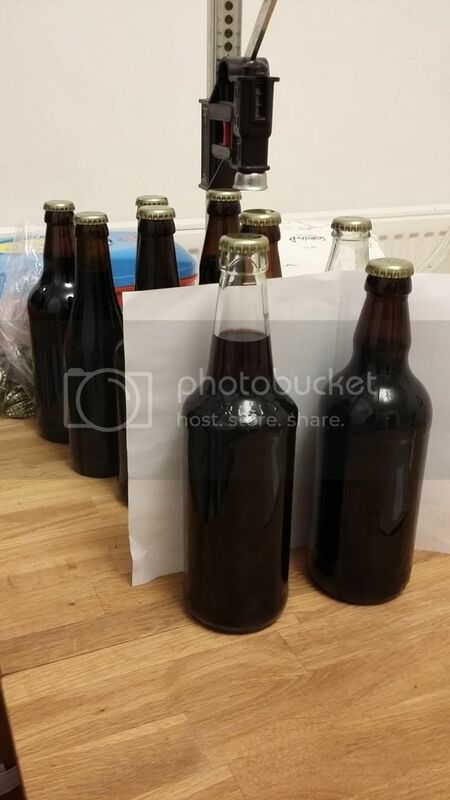 So I've just bottled this up. It still tastes really nice! And looks the part too!! It is a deep red not black.... honest! So I forced my family to try this at a Christmas meet up a couple of weeks ago. The reviews were all positive. It's a little on the sweet side, and subsequently tastes a bit like port.... it also appears to be quite strong! I'm very pleased with it. This is the first wine that I have made that is drinkable!